2004 is a year that Chad and Michelle will not soon forget. It was the beginning of a love of all things Disney. Chad grew up in Florida, so as a child he visited Disney World multiple times a year with his family. 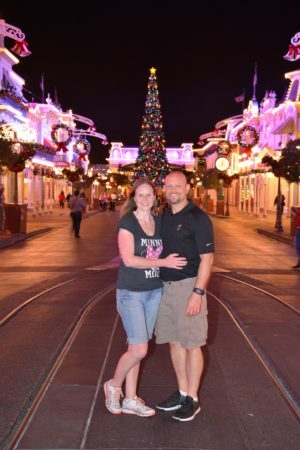 In 2004, he took Michelle on her first trip to Disney… and she was hooked! Ever since that fateful trip, the Uretskys eagerly anticipate scheduling their biannual trips to Disney. From the hotel reservations to FastPasses, from matching Disney outfits to what snacks they load in the cooler for the fun-filled drive from Texas to Orlando, they take great pleasure in planning every detail, no matter how big or small. Among their friends, the Uretskys are known as “the Disney family.” Having been constantly approached by friends for advice about planning Disney vacations, they realized how much fun it would be to share their love and knowledge of Disney with others and help them plan their dream vacations. Chad and Michelle offer a unique perspective to Disney planning. Having children with widely differing ages, they have learned how to tour the parks while keeping a tween, preschooler and infant happy. Further, due to ongoing health issues, Michelle requires the use of a wheelchair during their Disney vacations. As a result, they are quite knowledgeable about how to plan trips for those travelers in need of special assistance while touring the parks. The moment the Uretskys drive under the “Welcome to Disney World” sign, they feel like they are home. They are so excited to share their knowledge and love of Disney in helping others plan every detail of their dream Disney vacation! Contact Chad and Michelle today at uretsky@smallworldbigfun.com or 281-360-2445.